Scythe are a name synonymous with aftermarket cooling enhancement products. I would like to wager that there aren't too many PC enthusiasts who hadn't at least seen, owned or heard about this well known Japanese based company's products. But who are Scythe, and what do they do? Today I have been given the opportunity of reviewing Scythe's latest product: the Scythe Ultra Kaze 120mm Fan/s. Only recently released, the fans promise more air flow and an increase in static pressure which should make these the perfect candidates for heat sink and radiator cooling duties. 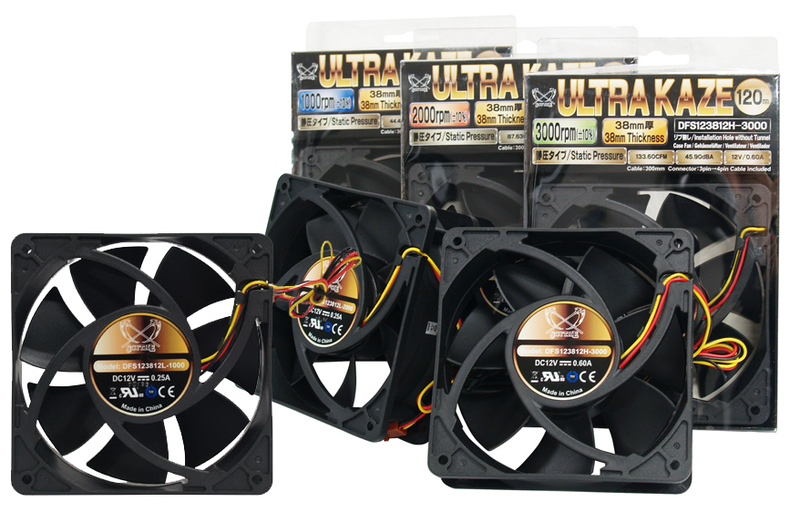 The Scythe Ultra Kaze range of 120mm fans are available in 3 different flavours: 1000 RPM, 2000 RPM and 3000 RPM versions. Will these be the next 'must have' item on the air cooling and water-cooling enthusiasts shopping list? Well follow with me as we seek to answer that very question. Let's make a start by looking at the Ultra Kaze' specifications. The Scythe Ultra Kaze' range certainly looks very good on paper. However, the MTBF estimation is extremely low even for a bearing fan. Scythe's Minebea range of cooling fans utilised bearings and had a MTBF of some 160,000 hours. Big difference!